ASCOM and EQMOD are wonderful things. That so many people and companies are willing to work on a standard like this and make it available for free, and then to produce software of the quality that we see in Astro circles never ceases to amaze me. Making this sort of thing available for no cost has opened up the world of computerised mount control to many, including me. ASCOM actually governs a set of standards for interconnecting astronomical devices that is, in theory, vendor independent. I.e. it allows different software and devices to talk the same language to each other for each to control the others. You can find out more about it all at ascom-standards.org. That explains it in much more detail that I (and most others) would ever need to know. Suffice to say that, once set up, it makes using your equipment even more of a pleasure. I never felt comfortable using Stellarium or Cartes du Ciel to control my mount, mostly as it involved messing around with a trackpad on my laptop in freezing conditions most of the time. 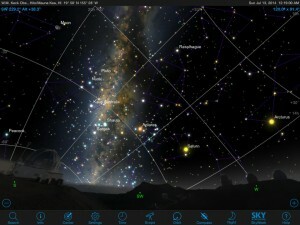 However, there are a new crop of planetarium programs becoming available for tablets and smartphones. 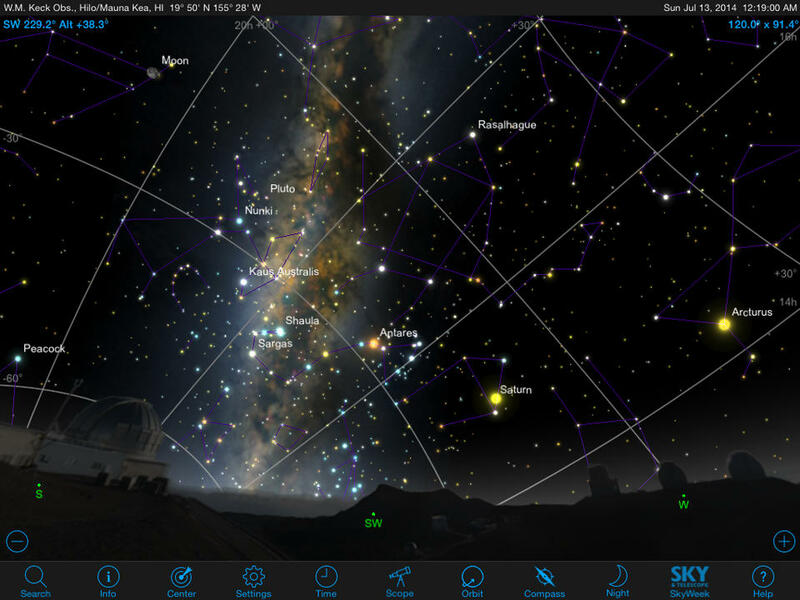 SkySafari is one such planetarium program. It’s actually available for OS X on the Mac (this version has no scope control), for iOS (iPhone, iPod touch and iPad), and for Android phones and Tablets. The version I use is for iPad and iPhone. Several versions are available – the standard version is cheap, and includes only the basic object catalogue, and, unfortunately, no telescope control. The ‘plus’ version adds in a slightly larger catalogue, and the all-important telescope control. The ‘Pro’ version adds a massive catalogue and various other stuff such as higher quality images for objects. At under £30 it’s not too expensive, even for the pro version, but the plus version is £13.99 full price. At the time of writing, all versions of SkySafari 4 are actually 50% off until Jan 20th 2014. Version 4 is not available for Android as of yet, but I’m sure it will be shortly, hopefully with the same deep discount for the first month. Using SkySafari 4 is a pleasure. Even just as an unconnected planetarium program, I can spend hours just looking around the virtual sky. However, the real magic comes when you connect it to a mount. ‘How do you do that?’ I hear you cry…! Well… there are actually several ways. 1. Use SkySafari from the iPad/iPhone, connected via the ‘official’ hardware. This consists of a choice of wired (the SkyWire – http://southernstars.com/products/skywire/), or wireless (SkiFi – http://southernstars.com/products/skyfi/index.html).This option makes it possible to control the scope ‘directly’ via a wired or wireless connection. This is great for visual use, and makes using the scope, and setup, very easy. However it totally cuts the laptop/PC with ASCOM installed out of the equation, so if you need that to perform other tasks (guiding etc), then you are possibly out of luck. However, it may be possible to still guide using a PC, if you have a guide cam with a ST4 guide port, and a compatible mount. However, there are other things that ASCOM is good for, so being a lover of EQMOD, I’d definitely not want to go down this route. It also has the disadvantage of being (relatively) expensive. It costs £59 for the basic cabled one, and a whopping £149 for the Wifi version. In my mind, this would be a good ‘grab and go’ setup to take out for visual use. 2. The other (free) way – Via a Wifi Connection and WiFiScope. If you have EQMOD set up already, this way is a doodle. It uses your ASCOM-runing PC as an intermediary between SkySafari and your mount. Basically, if you have your mount already running from a laptop, you just need a little bit of (free, woohoo!) software called ‘WifiScope’ (http://www.mainsequencesoftware.com/Products/WiFiScope) , that sits there translating the SkySafari protocols into ASCOM stuff, and therefore into commands your scope can understand. You just install it, let it know what mount you’re using, and set it going. You can then set up SkySafari on the iPad, iPhone, iPod Touch, or Android device, point it at whatever IP address you’re PC has, and tap ‘connect’. As long as both your PC and SkySafari device are on the same WiFi network, then it should connect, and you should be able to ‘goto’ directly from the app itself, and slew suing the arrows. If so, you’re ready to GoTo align. Make sure that your time and date, and your coordinates, are identical in both SkySafari and EQMOD. I tend to enter the coordinates in both manually, rather than allowing GPS to set it, as GPS can occasionally be inaccurate. Also, in most cases, the ‘seconds’ part of the value can be rounded to ‘0’, as long as this is the same in all places that it’s set. For time, it’s best to set it from an internet source if possible. This is the default on iPhone and iPads etc, and can also be done on Windows in the time and date setup. 2) Copy it somewhere like your desktop (there’s no installer – it’s just an .exe file), and run it (see the note below first though). 3) Read the instructions that came with it to set it up. These boil down to selecting the mount, select the IP address to listen on (not even applicable if you only have one network connection like most people), and start it going by clicking ‘start’. Then just set up SkySafari as in the same instructions (this is all one sheet of A4 – basically set the IP address of your PC in SkySafari and tell it that the mount is an ‘LX-200 Classic’, even if its not! ), and click ‘connect’ in SkySafari. Don’t Select ‘Set Time and Location’ in SkySafari on the mount setup page. This tries to send the time and location set in SkySafari to the mount. I found that all this did was make the connection unreliable, with often 5-6 attempts being necessary before it would connect, and frequent disconnections. One big point to note, and this is applicable to all EQMOD related programs that control the scope through EQASCOM… If you start WiFiScope before starting EQMOD, then it will start EQMOD for you. However, the thing to bear in mind is that if you do it this way, when you close WiFiScope, it will also close the instance of EQMOD, undoing any good work you’ve done in the meantime. Its best to start EQMOD using the ‘EQASCOM_Run’ shortcut in the EQMOD -> EQASCOM program folder on the start menu. Doing this starts an independent instance of EQMOD, that isn’t tied in to another program (in this case WiFiScope), and you can start and stop other things to your heart’s content without screwing up your EQMOD session. If all is well and good, you should have a session of SkySafari on your tablet/phone that is now connected to your mount via WifiScope and EQMOD. Lovely! To test it out, try slewing the scope using the controls on SkySafari. 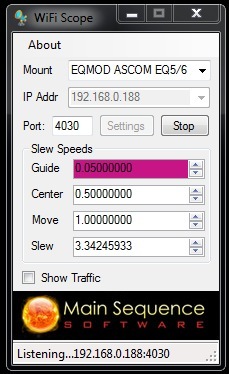 Note that you can change the values of the Slew speeds. I use the values in the screenshot to the left currently, though I may be tweaking this as time goes by. Strangely, you can only edit these when WifiScope is actually listening for connections, and the values only seem to save if you close WifiScope whilst it’s running. Strange but true! 1) Make sure the ‘User Interface’ section within EQMOD is set to ‘Append on Sync’. This allows SkySafari to place alignment points within the alignment list in EQMOD. This is vital for carrying out GoTo alignment from SkySafari. 2) Select a star in SkySafari. Tap ‘goto’. The scope should slew close to the selected target alignment star. 3) Use the arrow keys on SkySafari, or those on EQMOD, or even a connected gamepad, to slew the scope to move the selected star into the centre of the eyepiece. If the first slew is far out, then it means its fairly likely that your home position was not that accurate. A bit of magic that you can perform here is to loosen the clutches and manually move your scope so that the target alignment star is within the finder. THIS IS ONLY APPLICABLE AFTER THE FIRST ALIGNMENT SLEW! It effectively fools EQMOD into thinking that your home position was more accurate than it was. Tighten the clutches, and then use the arrow keys/gamepad etc to centre the star in the eyepiece as usual. 4) Click ‘Align’ in SkySafari and confirm the alignment on the box that appears. In the ‘Alignment/Sync’ section in EQMOD, you should now find that you have a ‘Point Count’ of ‘1’, meaning that SkySafari has told EQMOD to ‘Sync’ the expected current position of the scope with the actual current position. In SkySafari, the crosshairs will also have been placed back directly on the aligned object. 5) Repeat steps 2 to 4 as many times as you see fit. In theory, you should try to align on at least three stars for accurate GoTos, and the three stars should be distributed around the sky. However, even a 1-star alignment will help in that particular section of sky, and many experienced imagers I know just align on a single star close to their target then do a GoTo to the close-by deep sky target. Seems to work! However, if you’re doing visual work and want more accurate GoTos around the sky, then at least three stars is a good idea. You’ll find that SkySafari will disconnect if the device sleeps. This isn’t a problem. Just wake the device, go back into the app if required, and SkySafari should reconnect to WiFiScope. You should now be able to use the GoTo function in SkySafari to send your mount slewing accurately around the heavens. This is actually the closest thing to a documentation for WiFiScope, I have found. Unfortunately I didn’t find it until I had already experimented my way to choosing the LX200 Classic setting in SkySafari for EQMOD.